The knitters have probably been feeling a little left out lately since most of the designers I work with for guest posts are exclusively crocheters. So I was really excited when Annie, of Annie’s Arts and Follies, contacted me about sharing her Single Skein Scarflette Pattern! This gorgeous feather and fan design adds a beautiful touch to absolutely any outfit. 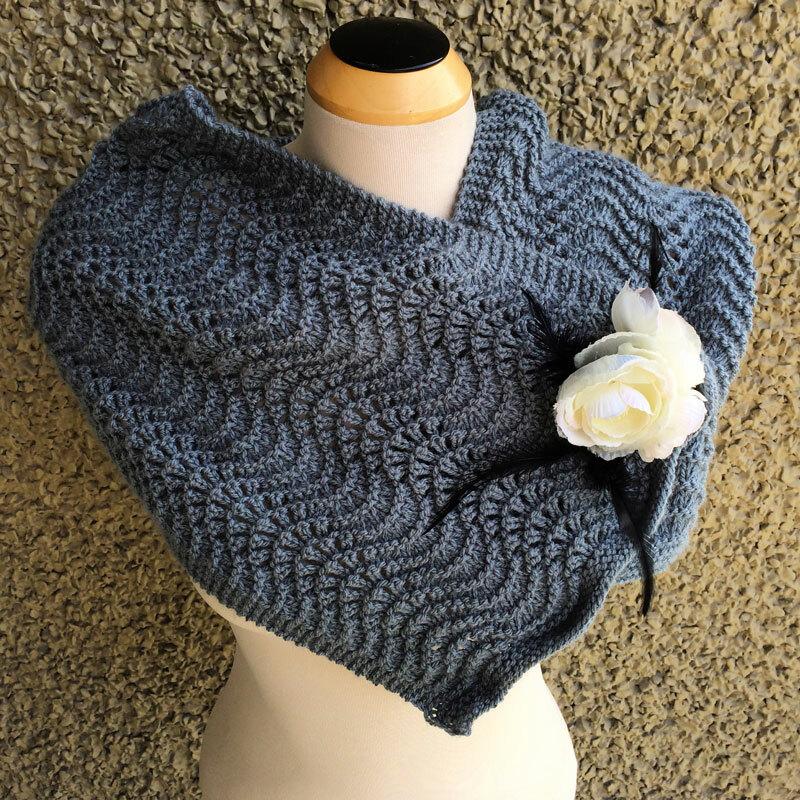 Add a gorgeous brooch, and this free knit scarflette pattern is the picture of elegance! Thank you to Annie of Annie’s Arts and Follies for contributing this adorable free feather and fan scarf knitting pattern as part of my Guest Contributor Program! “Every single knitter I know has a small hoard of single skeins just waiting for something awesome to happen. 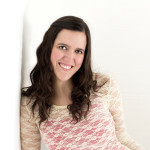 Recently I have launched a campaign to end the single skeins in my stash and make amazing things. I love the simple yet elegant look of the fan and feather pattern (you will get so many compliments and those not-in-the-know will think you are a magician). With a few adjustments, it makes an amazing scarflette. Quick and easy. Repeat Rows 11-14 to desired length – use that skein! 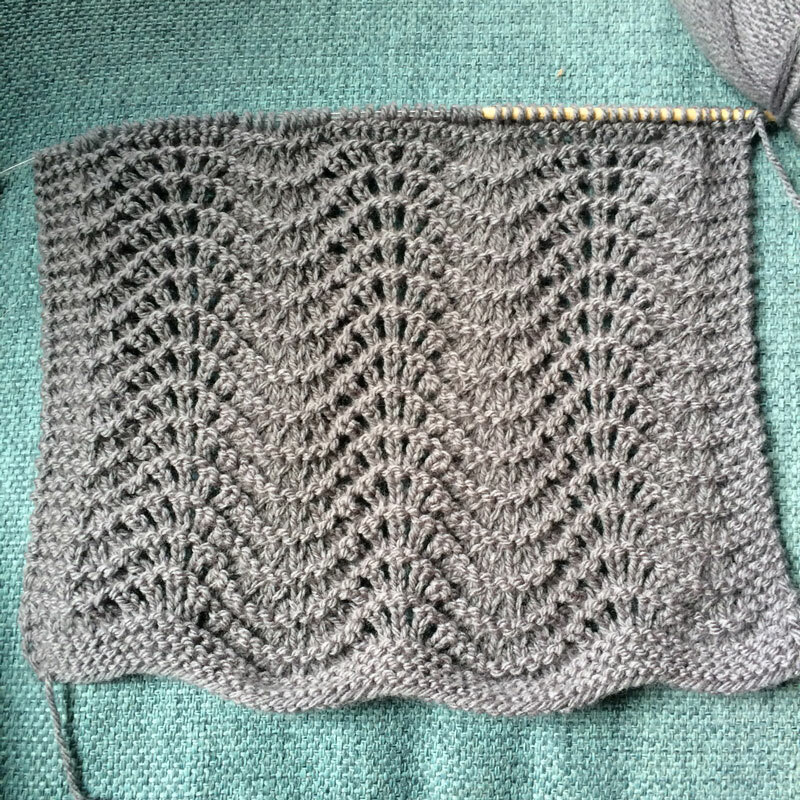 – then knit 10 rows and bind off. Hand wash and lay flat to block and wear with a fun pin or brooch. Annie Ciszak Pazar is a silversmith in Anchorage Alaska, specializing in one of a kind handcrafted jewelry, and brings the ‘funk’ to ‘functional.’ With a professional education in jewelry design and metalsmithing, Annie is forever experimenting with new techniques and styles, mixing old with new, to bring you one of a kind funktastic style. When not in her private studio doing what she does best, she is manning her brick and mortar shop front boutique in the up-and-coming midtown section of Anchorage. When not wielding a torch, Annie hoards books like a squirrel, knits compulsively, obsesses over Tudor England and is planning the next great international travel adventure. Oh, and she is slowly taking over the world. Visit her Etsy shop by clicking here. I have always loved the feather and fan pattern and am so looking forward to making this scarf. What a lovely one-skein piece. Out come my knitting needles. Thanks to Melody and especially to Annie. Thank you. I am looking forward to continuing my knitting skills learned through your recent MKAL. I love feather and fan, makes for beautiful and warm and ekegant items. Thanks for the pattern. Always looking for something new. It is so beautiful and looks so soft. I am excited to make one. I am not finding how to save the pattern like it usually does. It might be me though lol? Looking forward to knitting this. Thank you! Something so simple and yet so pretty! thank you Melody! When it says slip first stitch in each row as if to knit, is that every row or just 11-14. Beginner here. Thanks. Every row 🙂 It creates a more even edge if you always slip the first stitch. And that counts as 1 of the knit 4 in rows 11 and 14? Sorry, just trying to figure it out. No, no. It doesn’t count as a row, just the very first stitch of each row. You just slip one stitch and then complete the rest of the row. No, I mean, do I slip then knit 4 or slip and 3 more. If I want to increase the width what is the number of stitches is the pattern plus ? ? The pattern is worked in intervals of 18 + 8. Why circular needles & not regular straight needles for this pattern? I am a new knitter and I don’t understand the last part of row 11. Repeat from ( to ) 2 more times for a total of 3 sets, it is the ( to ) I don’t understand. Thank you for your help. The section that is in the parantheses should be repeated 2 more times for a total of 3 times. Does that help? Thank you Melody for this beautiful pattern. I have some of the Caron Cakes that everyone is so crazy about right now and have been searching for the perfect pattern. This will do nicely. And it’s easy to read and in such a pretty font. Amanda, did you get an answer to this? It is confusing to me also. Slip and then 3 more. I just checked the pattern, and it’s correct as written. You should be working with 18 sts between the ( ) a total of 3 times, for a total of 54 sts. The 4 outermost sts on either side make it a total count of 62. Thank you for such a lovely pattern. I have spent hours on many websites for just the right pattern and this is it. Easy and I like the feather and fan design. Thank you again for sharing. I will be checking your website again. Need help!! Row 11- I have worked it twice and get far more stitches. I feel it is in the yo that seems to be adding more. I know in reading and counting it totals 18. This what I do K2tog 3 times, yo,K1 6times, K2tog 3 times til last last 4K and I have only 62 st when I start this. I hope you can solve my problem. P.S. I have done the first set okay. Sorry but could you explain what is the decraese stitch. Is it the same as PSSO. which is certainly why I have so many stitches. Is the yo then K1 and decrease by passing the yo stitch over the K1??? i know I am confusing myself. and finally found out what I was not doing as you said the repeats. I have not started it again but hoping this solves my problem. Being a beginner and loving feather and fan pattern, I find it VERY confusing. I would like row 11 to be written out this way…..
Slip first st as if to knit, knit 3, knit 2 tog, knit 2 tog, knit 2 tog. Wrong number of stitches… Please help me, thank you. Between each ( ) you should have a total of 18 sts. 3 total decreases (worked over 6 sts), 6 total increases (worked over 6 sts), and 3 more decreases (worked over 6 sts). Hope this helps! I am the ‘confused’ one back in September when I first left ???. Thank you and do wish your holidays will be merry and bright. Aha–I pretended to “Like” and the pattern showed up! Thanks! 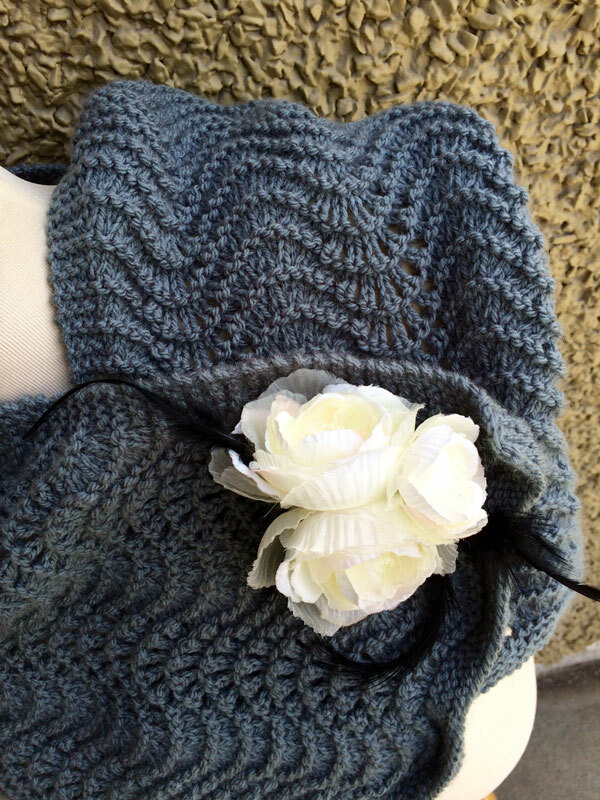 Beautiful pattern…have the perfect one skein to use – thank you for this lovely design! I love this design and can’t wait to make this. I’m curious, has anyone made this with gradient colors? If so, how did it turn out or is solid color the best way to go? I haven’t seen it done in gradient yarn, but I bet it would look gorgeous! Soooo beautiful. I’ve read comments here, but am still unsure about the slip because there isn’t a reference * in the pattern that matches the * of the slip. So, do I begin slipping on Row 1 or Row 11? Thank you for the pattern and assistance.